ʻAnaehoʻomalu Bay is a good place to kick back after shopping at the farmers market at the King's Shops. This market is different from other Hawai‘i Island farmers markets in that it is located on an outdoor promenade through a shopping complex. Located at the Waikoloa Beach Resort, the farmers market is nine months old and counts 12 to 15 vendors on any given Wednesday morning. The King’s Shops management provides the vendors with tents, tables, location, and facilities coordination in exchange for a monthly stall fee. Vendors hail from as far away as North Hilo and Hamakua on the windward side, and from North Kona, Waikoloa and Kohala on the leeward side. The King’s Shops Farmers Market was originally conceived as a boutique venue for high quality products. Its growth is limited to the current number of vendor by the space available in the mall. Market manager Tammy Touchet explains that with their continued success they hope to be able to find creative ways to expand the market and include vendors selling prepared breakfasts and lunches in the near future. Live music entertainment is provided and in the near future the management is planning to bring in chef demonstrations. The mixture of food products includes locally grown vegetables, many exotic, tropical fruits, and locally farmed eggs. Approximately one-third of the products are certified organic and two-thirds are chemical free. Many value added food products are featured, which include Hawaiian-grown and processed macadamia nuts, sea salt, honey, jams, teas, beef jerky, fruit and nut spreads, brittles and other candies; artisanal French breads and other pastries; Hawaiian sweet breads, kettle corn and tropical juice drinks. There is also a small amount of quality locally produced non-food items. The best selling items are the organic lettuces, all tropical fruits, jams, kettle corn, macnut products and the French baguettes and rounds. This season mangoes were in high demand and short supply. 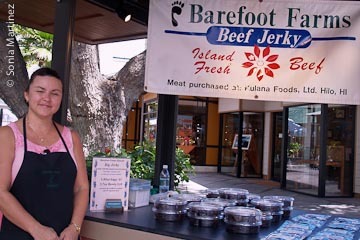 Kim Erb of Barefoot Farms Hawaii. Paige and Sam Wilburn own the Hawaiian Volcano Sea Salt Company also based in Honoka’a. The company markets 100% natural wood-smoked sea salt. They obtain the salt as a byproduct from another company’s desalination of deep sea water for bottling. The Wilburns, who have been selling their product since June of this year, smoke the salt using renewable and sustainable wood from wild guava and keawe trees. They have been participating at this market for only two weeks and can also be found at the Waimea Homestead Farmers Market on Saturday morning. Kevin Beckley of Hawaiian Rainbow Farms. 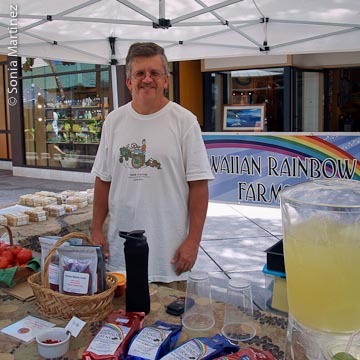 Hawaiian Rainbow Farms located in Honoka’a on the way to Waipio Valley is owned by Kevin Beckley and his wife Cindy. The farm has been in operation for a little over two years and has participated at this market for four months. They also sell at the Waimea Mid-Week Market at Anna Ranch on Wednesday afternoons. Although the display of coffee, fresh and sundried tomatoes, fresh and dried fruits and handcrafted natural soaps was very enticing, what attracted me on this hot, dry day was a large container of limeade which looked very refreshing and cold! Kevin mentioned that some days he serves limeade and other times it will be lemonade. It definitely was cold, thirst quenching, and delicious. 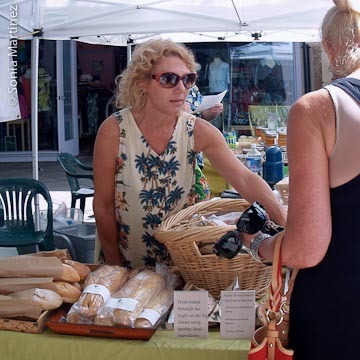 The Palani French Bakers was represented by Tammy Touchet who owns the company with her husband David. The company’s production facility has been based in Kawaihae for the last two years. Tammy and David own Gold Coast Farms where they grow all the herbs used in their French style herb breads. Tammy has been participating in this market since the beginning, in December of 2010, as well as other markets in Kona and Hawi, while David participates at the Waimea Mid-Week Market at Anna Ranch. Tammy Touchet of Palani French Bakers. The selection of baked breads and pastries is varied and enticing; making a decision is hard! 100% whole wheat, 5 grain, French Round, Rosemary French, Oregano Parmesan Baguettes, Pain au chocolat, Croissants, cinnamon, Cardamom, Raisin Danish and Macnut coconut Bear Claws are just a few of the delectable offerings you can find. Jim Pushaw and Marta Walker of Waimea share a booth both at this market and at the Mid-Week Market at Anna Ranch. Jim sells liliko’i, starfruit, tangerines, papaya and soon will be harvesting ruby red grapefruits, all grown on his farm as a sideline. Ask for a taste of his fresh liliko’i tangerine juice! His Pushaw’s Plants business located in the Kalopa makai area offers landscaping plants and vegetable starts. Jim has been attending this market since June. Marta’s company, Before and After is the label she uses to market the products she makes using the facilities of a local certified kitchen. Olives Oyl Tapenade was the first product she started selling in March of this year. Since then she has added a Zesty Papaya Jam (marmalade consistency with lemon zest), a Liliko’i Jelly and Strawberry Jam. The strawberries come from the local Rincon Farm in Waimea, the liliko’i is from Jim’s farm in Pa’auilo, and the other fruits for her products come from Hilo and Honoka’a. Rick Berman was making bouquets and flower arrangements using an assortment of proteas, banksias and eucalyptus grown at the High Country Farm, owned by partner Anne St. Johns in Pa’auilo mauka. The farm has been in business for approximately 12 years and has participated in agricultural events throughout the island for many years, but has been at this market for just a few weeks. Susan Bartaluzzi and her grandson William Touchet manned the booth for Gold Coast Farms, owned by her daughter and son-in-law Tammy and David Touchet. Susan found a lack of fresh greens at this market, and although she sells herbs from the farm she also brokers fresh organic lettuce and other greens from a farmer in the Hamakua area. In addition, Susan is selling copies of a local cookbook in her booth. 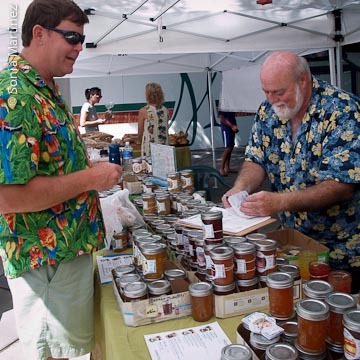 Steve Stefanko (right) of Honomu Jams serves a customer. The Honomu Jams & Jelly company booth was manned by Steve Stefanko owner of the Akaka Falls Farms, producers of a large variety of products, all made from fruits grown on the 5 acre farm located just above the Village of Honomu on what was previously sugar cane fields. The entertainment during our visit was provided by Colleen Roberts and Linda Schuster of Hawi who perform under the name of Coco & Linda “2 for the Show” and were passing out free copies of their CD. Sponsoring organization: Kings’ Shops provided location, tents, tables, facilities coordination, etc. Type of Market: Locally produced and/or manufactured only. 90% food products with a small amount of quality locally produced non-food items. How Funded: Funded with vendor rents. Cost per stall/booth: $120 per month per stall. a. Number of vendors: we are nearing capacity at 12 vendors. We will probably be able to squeeze in a few more vendors in the short term. With the continued success of the market, we may find creative ways to grow the market in the future. b. Increase in income: Tends to go up and down with the tourist season as this is a resort market. Geographical range of vendors: North Hilo, Hamakua, Kona, Kohala. a. Range of products: Veggies, fruits, herbs, eggs, processed/value-added. For processed items, we currently offer more grocery type of items than prepared, ready to eat foods. We may add some prepared breakfast and lunch vendors in the future, now that we have an established shoppers market. b. Growing methods: Approximately 1/3rd of our produces are certified organic and 2/3rd are unsprayed/claimed organic. c. Best selling products: Some of the best selling products are organic lettuces, all the tropical fruits, jams, kettlecorn, mac nut products, and French baguettes/rounds. Foods in short supply: This year, mangos are in short supply and everyone has been asking for them. Other special features: We have added musical entertainment to the market for the past few months and will continue to do so, based on the positive response from our shoppers. We are looking to add chef demonstrations and other entertainment in the future..